You can’t really talk about soloing on the guitar without understanding pentatonic scales. Normal, or “full” major or minor scales have seven different notes, while pentatonic scales have only 5 notes (hence “pent”). Today we will look at creating the Mixolydian scale by combining some major pentatonic with its parallel minor pentatonic. Mixolydian is used extensively when improvising over the 12 bar blues, other I-IV-V chord progressions, and more generally chord progressions featuring dominant seventh chords. What the heck is Mixolydian? Mixolydian is a mode, and modes are really just types of scales, much like major and minor (in fact, major is called the Ionian mode and minor is called Aeolian). Perhaps the simplest way to understand modes is to look at a major scale. Let’s look at C major, where our notes are C-D-E-F-G-A-B-C. Playing a major scale (in this case C major) but not starting or ending on C, creates our different modes. 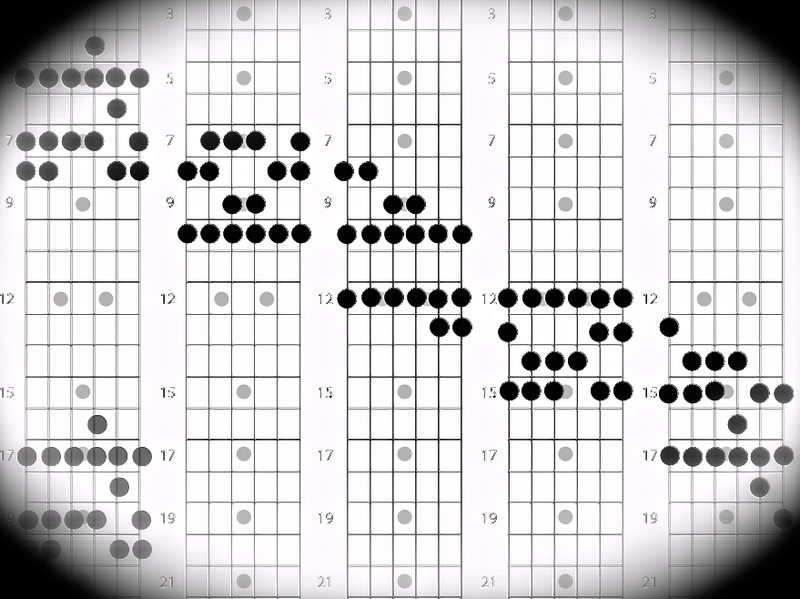 For example, the second mode, called Dorian (in this case D Dorian) would look like this: D-E-F-G-A-B-C. Similarly, the fifth mode, called Mixolydian, would have G-A-B-C-D-E-F as its notes. Notice that each of these modes consist of the same seven notes! We are just starting and ending in different places. These are modes. The accomplished guitarist would argue the most practical way to look at these modes is to think of them as either some kind of major or some kind of minor scale. If you compare G Mixolydian with G major, you’ll notice that there is only one different note, F, so we can think of G Mixolydian as being a type of G major scale (G major= G-A-B-C-D-E-F#-G while G Mixolydian= G-A-B-C-D-E-F-G). As you can see, combining the G major and G minor pentatonic gives us all we need to play Mixolydian. Achieving the Mixolydian sound can be as simple as playing the G major pentatonic over the 12 bar blues and then every so often switching to G minor pentatonic. If you are familiar with the CAGED system, this should be quite simple. Once you become familiar with switching in between the two pentatonic scales, you can begin to combine them (i.e. play a few notes from the major pentatonic followed by a few notes from the minor pentatonic) to further the bluesy, Mixolydian feel. Try this first over the blues in G, and see what you come up with! Of course, this can be applied to blues and dominant seventh chord progressions in any key as well. We learn about this technique in our advanced guitar lessons at Bold Music. That’s all for now — rock on!